One thing you might not know about me is that I am slightly obsessed with burgers. All different kinds. Everything from fully loaded whoppers to cute mini sliders. People are always surprised to hear that I eat meat because apparently all dietitians are vegetarians. 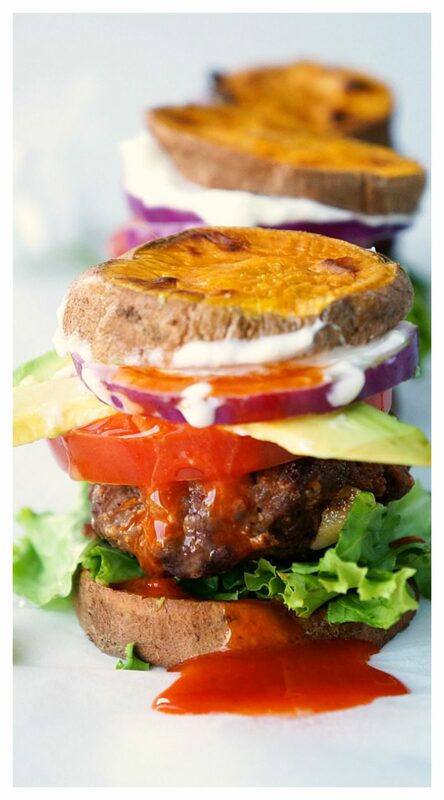 Although I love my meatless dishes, I could not live without my burgers. Life without a burger would be pretty darn miserable. Now obviously I don’t binge on fully loaded whopper burgers all the time because that would not be good for overall health or the waistline, SO when the cravings for a burger hit, I resort to my roasted garlic feta chicken burgers, avocado jalapeño burgers OR these tasty homemade sliders. What’s so amazing about these sliders? Now, I’m telling ya straight up that these aren’t just any old sliders. These, are the BEST kind of sliders. 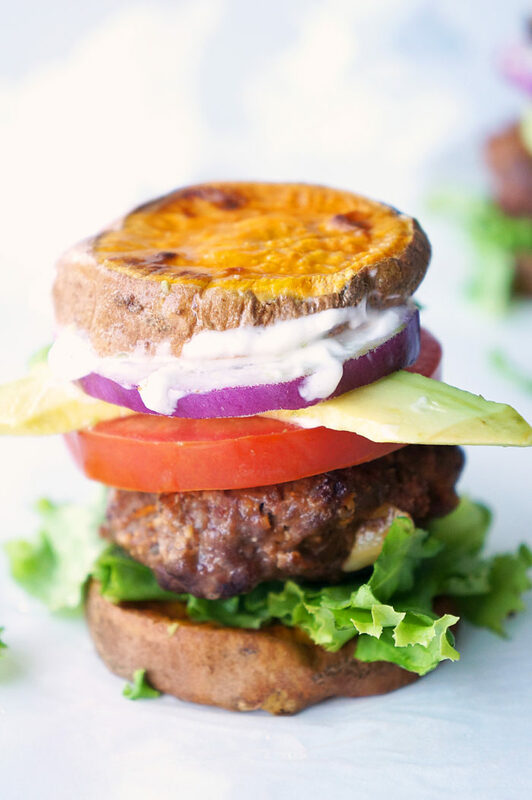 A juicy buffalo slider patty stuffed between two roasted sweet potatoes slices. Eat it with two hands, down it in one bite or savour each bite by slowly working away at it with a fork and knife. 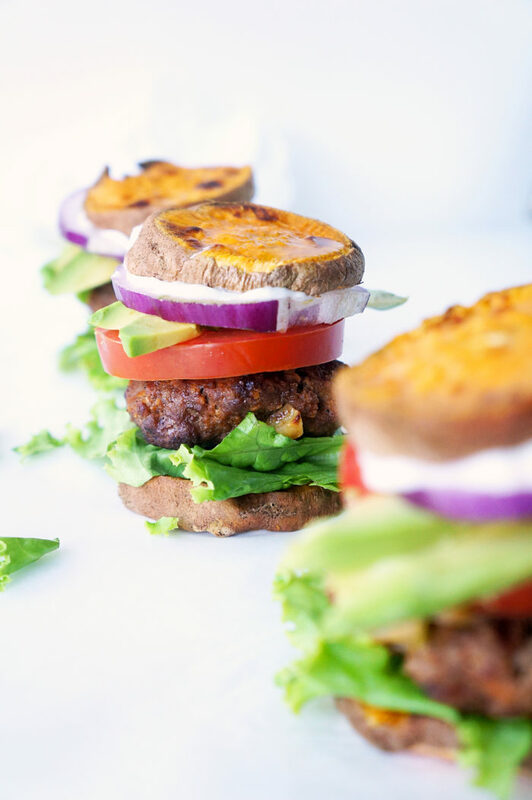 For sweet-potato-slider-loving fans, mini burgers don’t get any better than this baby. Especially when you load it up with all of the toppings and add this amazing roasted garlic spread AND an extra dose of buffalo sauce. Why the Sweet Potato Bun? 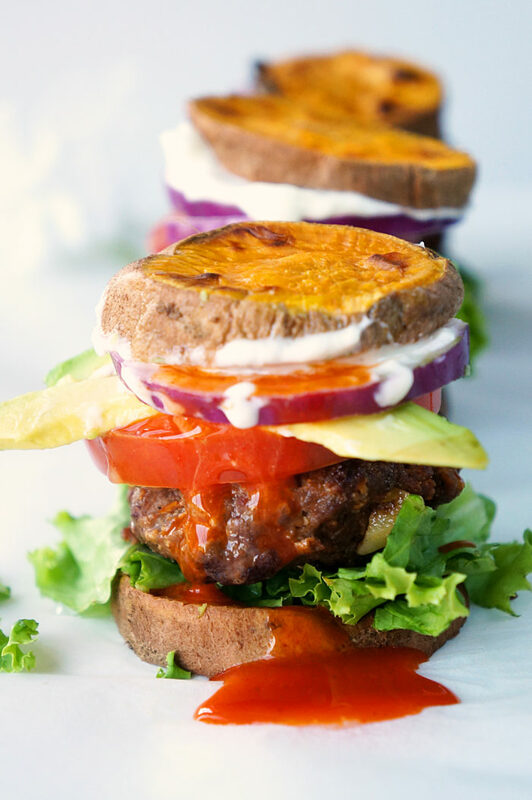 More nutrients – By replacing your typical bun with sweet potato, it adds some extra nutrients like vitamin A, C, potassium and fibre. 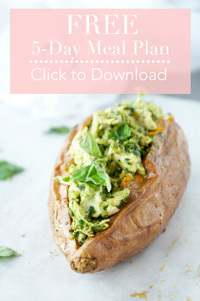 Easier on the waistline – Two slices of sweet potato amounts to only 20 calories and 5 grams of carbohydrates compared to your typical bun that weighs in at 200 calories and 40 grams of carbohydrates. Less work for you – The roasted slices of sweet potato are easier to get your mouth around which means it’s much easier for you to devour. Enough said. Lower on the glycemic index – one of my favourite things about sweet potatoes is that they’re LOWER on the glycemic index which means that you won’t be getting crazy spikes in your blood sugar (AKA more energy, a better mood, and less overall cravings!) Bonus. 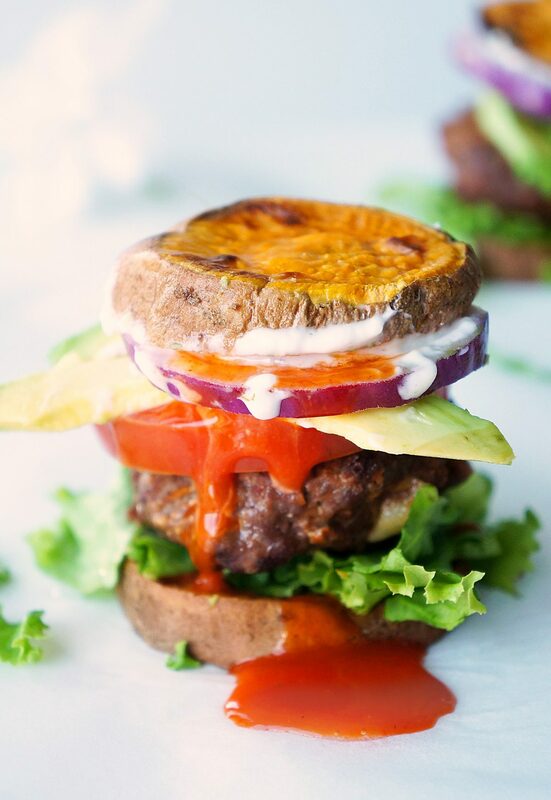 It’s just plain tasty – I find the addition of the sweet potato incorporates even MORE flavour to the already flavourful burger because you get that hint of sweetness that’s brought out by roasting the sweet potato in the oven. 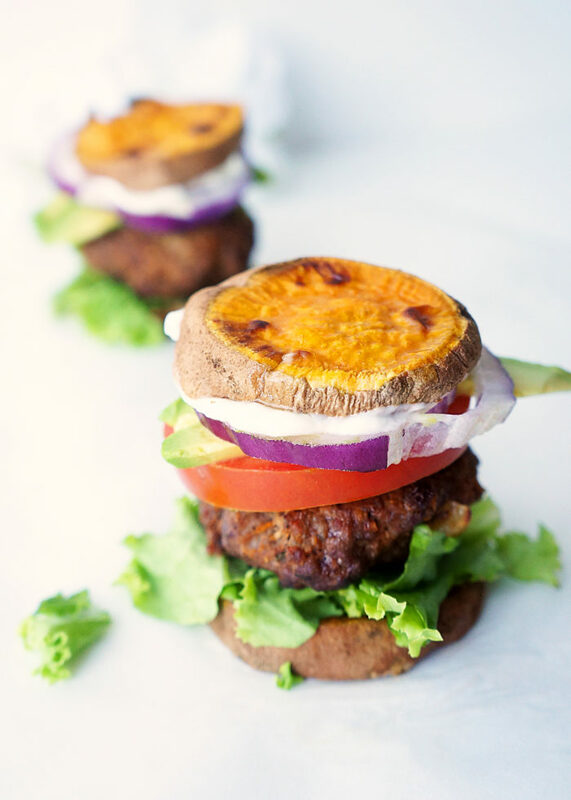 All the more reason to swap out the typical bun for some sweet potato slices! It really is a match made in heaven. 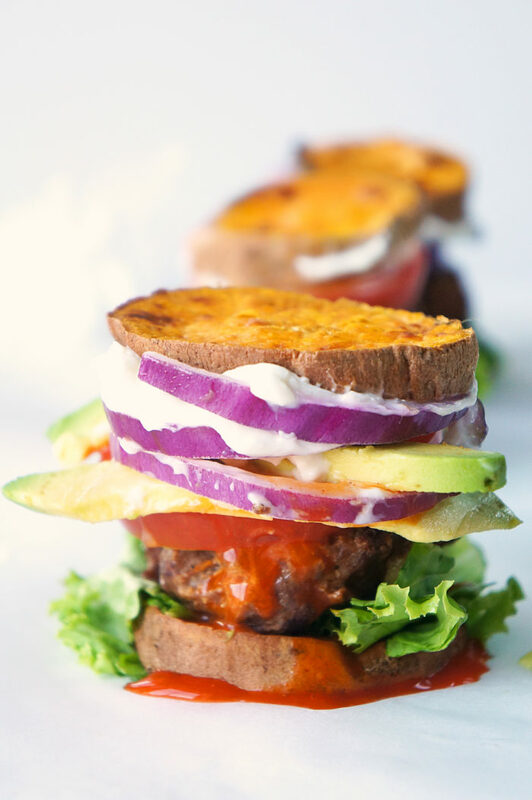 Buffalo sliders with Sweet Potato "Bun"
Arrange sweet potato slices in a single layer on baking sheet. Bake 15-20 minutes or until lightly browned and tender, flipping them over halfway through baking time. In medium bowl, combine chicken, garlic, green onions, buffalo sauce, almond flour and black pepper. Mix well. Divide chicken mixture into 8 portions. Flatten them into patties. When grill is hot, place patties over direct heat. Grill 5 minutes on each side or until cooked through but not overcooked. Don’t forget to download my FREE grilling guide here, along with getting access to all of my other free printables and resources!